Why is the sky blue? Why did dinosaurs go extinct? Why do fools fall in love? Why is it that the hair on your head grows long, but the hair on your body doesn’t? It’s a good bet that you won’t know the answers to most or all of these questions. But we know somebody who can answer the last one. That person is RHRLI’s own doctor, Baiju Gohil MD, who is an expert on hair restoration and all things having to do with hair. So we were thrilled recently when the folks at GQ approached Dr. Gohil to ask some questions about hair growth. Every day at RHRLI we answer questions about hair and hair loss. We also tell our patients about our permanent solution the ARTAS® System. It uses robotic technology to give you a minimally invasive hair transplant that will get you back to your regular life quicker than other facilities. We don’t just limit our expertise to the top of your head either. RHRLI will do eyebrow restoration and beard transplants among other services. So we want to share with you some of what Dr. Gohil discussed with GQ. Like RHRLI, GQ is certainly dedicated to making people look the best they can be and that’s why they asked Dr. Gohil about body hair. The starting point for the conversation was a discussion about grooming chest hair and eyebrows which led to the question as to why the hair on your head grows longer than the hair on your body. Dr. Gohil says the answer lies within the life cycle of hair. There are three stages of hair growth. The resting phase is called the telogen phase. There’s a transitional phase called the catagen phase and the growth phase called the anagen phase. But not all anagen phases are created equal. “For hair on the head, this phase lasts between 3-7 years for each hair follicle. However, for hair on our body this phase only lasts 3-6 months,” Dr. Gohil told GQ. The point where hair will stop growing is called “terminal length.” That’s the point when the other phases start. The terminal growth phase isn’t set in stone as aging people who have to trim eyebrows know. “As we age, skin sags and loses its fullness, making the eyebrow hairs appear longer, even though they are the same length,” Dr. Gohil says. “The keratin within each hair is not arranged as precisely as we get older, allowing keratin fibers to bend more easily than they used to. These more flexible hairs are not aligned with the others anymore in their usual eyebrow formation, and become more visibly apparent.” For aging women, hairs become more hormone sensitive, especially towards testosterone which can also lead to more pronounced eyebrow hair. 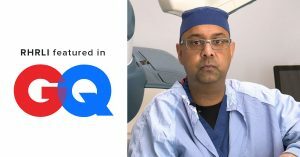 It’s not just GQ that has questions for Dr. Gohil. RHRLI knows that many people out there have questions about their hair loss. We’re happy to answer them and tell you why ARTAS® will give you a healthy head of hair. We’ll use a robotic arm to transplant hair from donor areas to where they’re needed with more precision than other procedures. If you have questions, we have answers. Contact us today. Previous Post: « Do Head Massages Stimulate Hair Growth?